Home » download yahoo messenger » instant messaging service » v9 » Yahoo Messenger new faetures » Yahoo Messenger (v9) –Media Playing Features Added by Yahoo Inc.
Yahoo Messenger (v9) –Media Playing Features Added by Yahoo Inc.
Yahoo Inc has recently added wonderful media-playing features, large file transfers, new languages and other tools to its instant messaging service - Yahoo Messenger (v9) for the Windows users. 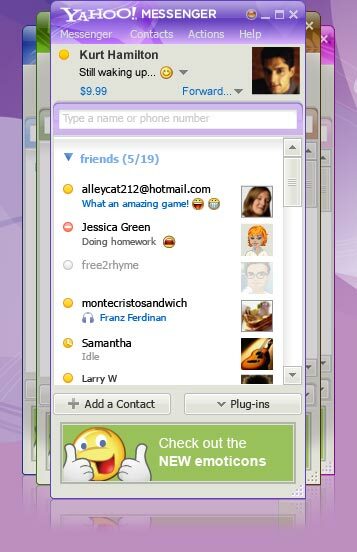 Yahoo Messenger (v9) is the outcome of competitive spirit of its rivals such as AOL, Myspace, and other social networking sites. Obviously, the purpose is to boost its position in the market for instant messaging services. The new messenger has good features like inbuilt ability to play YouTube videos & Filckr albums, new skins, more emoticons with great look and feel. In a chat conversation if you want to send YouTube video URL, this new Messenger 9.0 allows you to play the video inside chat window without visiting YouTube website. Another interesting feature is - you can forward messages to their mobile phones when they are away from the computer. See below the video demo released by Yahoo on the new features of Yahoo Messenger 9. You can download Yahoo Messenger 9 here. Yahoo is one of the largest instant messaging service providers with about 27.7 million users in September, up 19 percent from a year earlier, according to data from tracking firm comScore. Time Warner Inc's AOL reported about 30.2 million users.